In October 1861, the newly formed 79th Pennsylvania Volunteer Infantry left the train station in Lancaster, Pennsylvania--where nine of ten companies were recruited--and headed west. 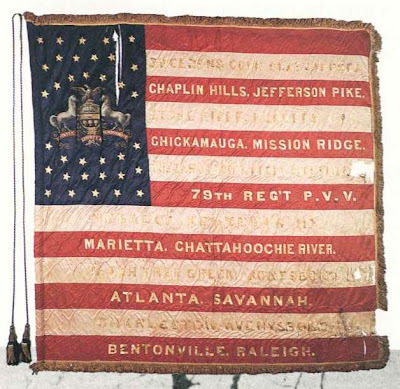 Instead of joining Union forces encamped around the nation's capital, they spent the duration of the war fighting in Kentucky and Tennessee and then later with General Sherman as he marched through Georgia and the Carolinas. This blog attempts to chronologically retell the stories from the battlefield and home front week-by-week that I've come across while researching the Lancaster County Regiment. I expect it to be a rather raw amalgamation of primary sources, almost like I would be inviting you to watch as I gather research notes for a regimental history, but I occasionally do connect what I find to academic Civil War scholarship. My hope is that the stories and historical drama contained therein fascinate you like they fascinate me. Although the 79th Pennsylvania's story is similar to many other three-year regiments who answered President Lincoln's call in the summer of 1861, the first thing to notice about the 79th Pennsylvania is that the regiment fought in the war's Western Theater from October 1861 until the war's end. At places with names like Perryville, Chickamauga, and Bentonville, the regiment suffered substantial losses but earned a reputation as well-disciplined and solid in battle. The second thing to notice is that nine of the regiment's ten companies hailed from Lancaster City or County, which offers a couple fun research angles and enables certain research efficiencies. With that said, here's my attempt to explain why it's worth focusing on the regiment for a blog. The 79th Pennsylvania was Lancaster's most focused military contribution to the war effort, with Col. Hambright being the county's main war hero with a public presence in Lancaster. Social and political connections between battlefield and home front also ran deep for the entire war. For example, we can watch Capt. William McCaskey and civilian J.P. McCaskey write at length about their respective efforts to advance the candidacy of Governor Andrew Curtain and President Lincoln during the elections of 1863 and 1864. Furthermore, the regiment's division commander, Maj. Gen. Lovell Rousseau, even visited Lancaster and give a public address in early 1863 a couple months after the Battle of Perryville. The fact that ~90% of the regiment came from Lancaster County--a mid-sized town with a handful of newspapers (including three daily papers eager to print soldiers' letters) but not a lot going on--means it's relatively easy to find rich primary source content, especially when it comes to the interplay between the regiment and the people in Lancaster. I've found the Civil War's Western Theater to actually be more interesting than the Eastern Theater. Lots of land over which to maneuver, railroads to defend, and territory occupied by both secessionists and unionists that made the war feel like a true civil war. Very little has been written about the regiment, and some of the best primary sources have been left unexplored. Approximately 150 soldiers' letters from the 79th Pennsylvania were published in Lancaster's newspapers. Some very interesting characters have left fantastic accounts of their war experience: William McCaskey, William Kendrick, Oscar C. M. Caines, William T. Clark, Elias H. Witmer, among others. The regiment, city, and county had very interesting political dynamics, with Lancaster County providing some of the strongest returns for the Republican Party in Pennsylvania and Lancaster City playing the role of Democratic stronghold. What else would you expect of the place that both James Buchanan and Thaddeus Stevens called home? I also have an ancestor (Pvt. George/John Fleischman/Fleishman of Co. B...obviously I haven't done my research) who married a g-g-great aunt, but I don't really know anything about him except a family rumor that my g-g-grandmother, a farm woman, didn't care for him and his wife due to their improved social status from the pension they received. During the day, I work to describe the world through numbers, Greek letters, and equations, all in the name of improving operations' efficiency and effectiveness. At night, I turn to ideas and words--mine and others'--to describe the world and have chosen to taken a microscopic view of one particular community's Civil War experiences. 2000: Joined Civil War Explorers Post, a unique club for local high school students interested in the war. 2001: Participated in the filming of Gods and Generals as an extra. Terrible film but lots of fun to participate in its making. 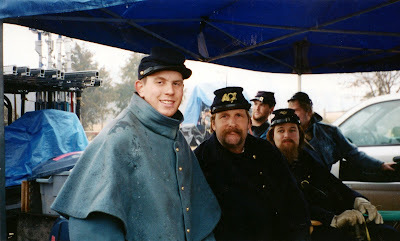 2002: Joined the Lancaster County Living History Association, portraying Co. B, 1st Pennsylvania Reserves. Began deep and hard-to-explain interest in Lancaster's Civil War history. 2004: Met up with another Civil War Explorer named Lindsey for a "research session" at Lancaster County Historical Society's archives. A real first date ensued after a couple such meetings lit by the glow of the microfilm reader. Marriage ensued in 2008. 2004: Went to Penn State to study engineering. Took an honors class on post-1877 American history with Dr. Carol Reardon, even though I already had AP credits for that particular class. 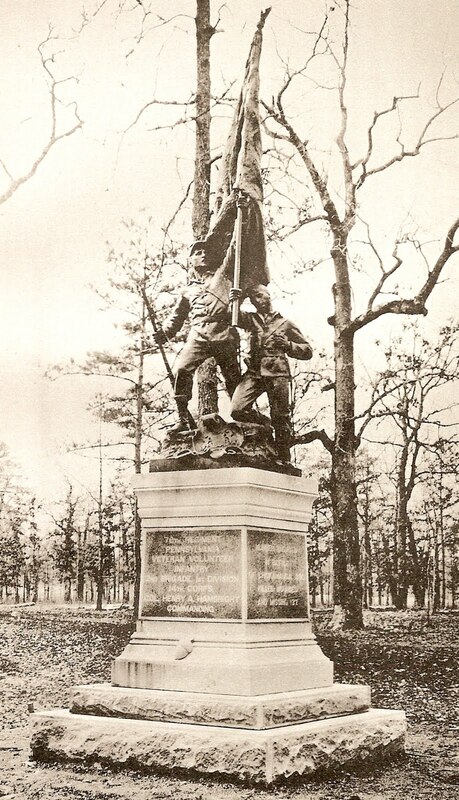 For my semester paper, I wanted to do something Civil War related but to satisfy the post-1877 requirement chose to try to figure out how one of Lancaster County's regiments, the 79th PA, put up a monument at Chickamauga in the 1890s. Became hooked on the regiment. 2005: Began spending large amounts of time with Lancaster's wartime newspapers researching the 79th Pennsylvania for a research project on battlefield-home front connections in the aftermath of the Battle of Perryville. 2006: Interned at the Lancaster County Historical Society. Worked the hardest I've ever worked over a six-week period to curate an exhibit Lancaster Remembers the Civil War, 1861-2006. 2008: Economy crashed. I chose to pursue studies in industrial engineering/operations management over history. 2009: Moved to Pittsburgh. Civil War interest has been mostly on hold...until now. The Brown family at Devil's Den, c. 1930.